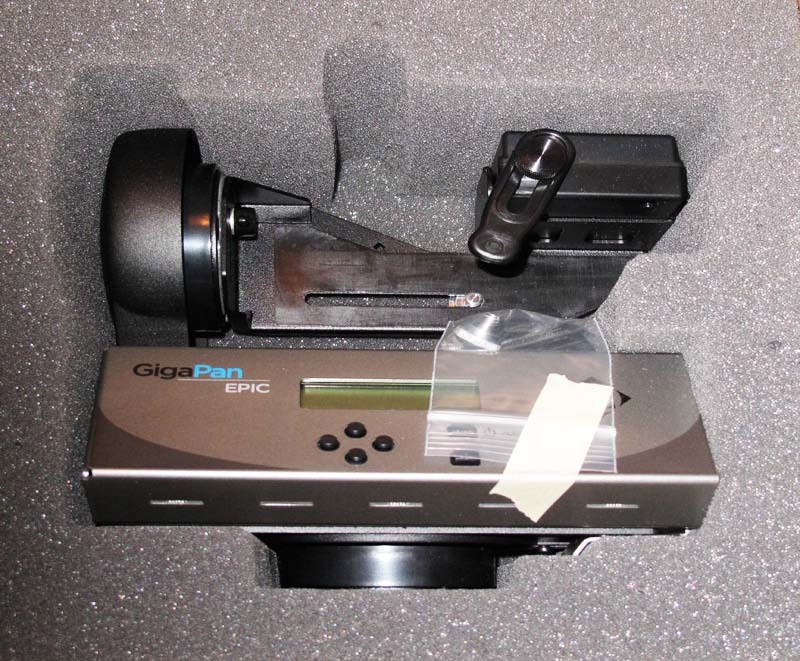 Review: Review of the Gigapan Epic for Digicams like the G10 and the Ricoh GX200 and more! II have just taken delivery of the Gigapan Epic, the small integrated programmable panohead to moun t on your tripod and hold your digicam. This version is for Digicams from any MFR where the focus and exposure can be set and there's enough ISO sensitivity for the lighting. I'll try it with the Canon G10 and then with the Ricoh GX200. I was surprised by the small light package that arrived 3 minutes before UPS ceases to deliver for the day. This looks well made and there is a firm solid feeling to it. It's main box has a window with text instruction that's easy to follow. It's already assembled, just add batteries. That requires the door at the right to be swung open and the cord to the battery holder to be unplugged. Then, and only then can the holder be slid out. Putting in the AA batteries is a challenge as the springs are too long! Compressing the spring to hernia force got in one side but not the other. So I did surgery and cut of a tip of the spring and said a blessing, LOL! The loaded battery holder slides in easily, the plug works, the door closes fine and then the Gigapan fires up when the top right hand button is held down. We need pictures of the machine! Soon as I can! Promise! The Gigapan Epic is the first model in the current Gigapan auto panohead series. This is designed for any light digicam. A heavier duty form, the Gigapan 100 is available shortly and will take the larger digicams. Then the even heftier version will appear and this should handle DSLR's although I don't know that it would take full size lenses like the 70-200 f2.8. We'll get to that down the road. 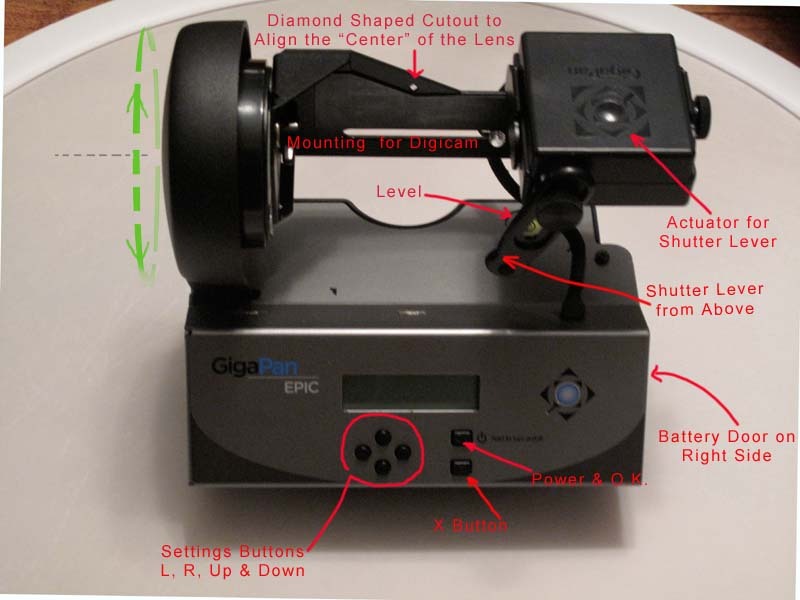 Aside: A most important addition: Before we get into the details of my experience, let me direct you to the wonderful PDF instructions for using the Gigapan Epic here. Be patient in the download. It's full of hints great for taking any Pano. It differs from AutoPano Pro recommendations in just one respect. Lionel of Kolor, which makes APP suggests using the camera in autoexposure, a difference from the classical advise from panoramists. Gigapan holds the classic view that we should lock exposure. 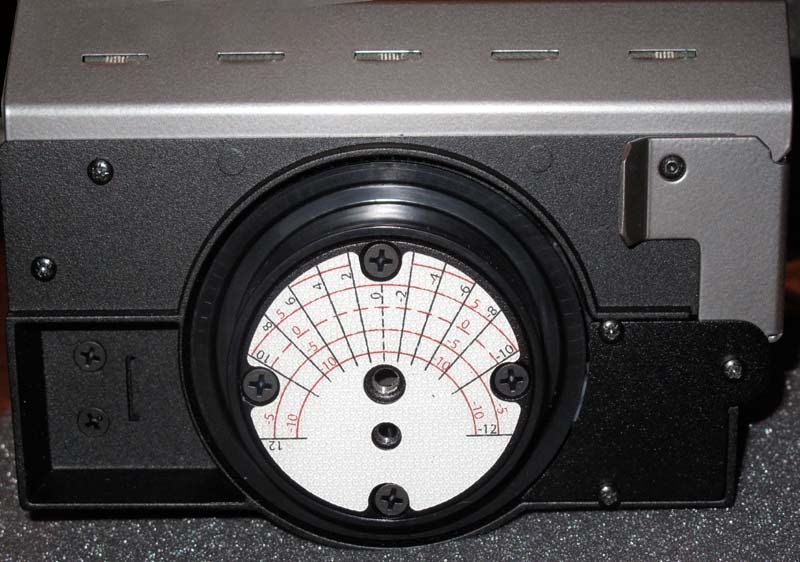 Lionel asserts that when the software includes (especially) sky blending capability, software will give a deeper dynamic range probing into the shadows. Notice the horizontal mount for the Digicam has a slot in it in which a threaded bolt sits for fixing the camera to the Gigapan Epic using the camera's tripod mount. Next to it is the adjustable lever which will hopefully depress the shutter. This was a design decision to allow the myriad of digicams to be used without worrying about protocols for shutter control. To the left of the base with the visible horizontal slot for holding the mounting bolt, there's another bolt on the side. This is the forward-backward adjustment to get the optical center of the lens (ie the entrance pupil) centered on the axis by which the Gigapan epic tilts down forward or raised up for shots needed to complete a 360 degree sphere of images if one so desires. An aside: The base image, where the tripod is, would still have to be taken freehand. It's a good idea to do this first if there is grass as after the session, there maybe accumulated damage to the grass or footmarks that could be untidy. The Gigapan Epic viewed from the back, user interface side. Notice the base plate for mounting the digicam is swung forward so we see it facing us. The axis of the camera platform is able to tilt down and up. The center of the platform is also able to rotate around the optical axis of the lens. Aside: I do understand, however, that there has been a whisper that the coming DSLR version will use a USB control. If this turns out to be true, I cannot say, but sure would be preferable. I'd even like the whole device to be slaved by a Palm Pilot or ipod or laptop! However to do that there are other options using a astronomy telescope motorized tracking mount that one has to make some adaptions to use. Here Gigapan does it all for us). The Epic meant to be used with Digicam lens extended. That way one gets a more detailed final stitched panorama. I mounted the Epic on my Manfrotto 3047 Head, which has the advantage of quick release levers and a stable grip. I do not use a ball head but that might change as a RRS head would be more compact perhaps. I've mounted the head on a Manfrotto Carbon One 440 which is heavy enough to be sturdy and still not to much to carry! Pictures of that in the morning. Then will be my first shoot! Thanks for following. Be free to ask questions. Well, today has been pouring cats and dogs and the remedies I did to the roof have held! When it rains, there's an orchestra of all the possible noises of water pounding, gurgling, dripping, splashing and cascading but it's staying outside. So I've been indoors. This gave me an opportunity read up on the Gigapan and get it working. I did mention that the Gigapan Epic has adjustments for the platform for the camera to be shifted fore and aft and the camera held in place by the 1/4 inch bolt in the horizontal slot allows it to be adjusted left to right. What I didn't recognize at first was the apparent omission of a way of elevating or lowering the camera so that the xy and z axis all go through the same imaginary point. Underneath the Gigapan Epic is the foot to be mounted on to one's tripod. It has a rubber friction matt so that the robot can be locked down easily. Ignore the intriguing markings suggesting a portion of a sphere! One would think it's something to do with the extent of the robots spherical movement, but it's not for that. It's a redundant copy of the actual height adjustment guide on the left side of the mounting tray, (looking from the control panel). This adjustment is explained below. The initial impression was that it's just "artistic" and was on something they started with. However, that Leonardo Da Vinci sketch is actually the essential guide for adjusting the height of The Gigapan robot. (It does not refer to rotation, just height. The Epic can deliver a full 360 degrees panorama and I'll be trying that later on). There is an additional vertical adjustment, and this is just for for the button lever activator and that's works fine to take account of the actual height of any digicam. One adjusts it close to the shutter button and then when the Gigapan robot send the trigger pulse, the button of the camera gets pressed down. However, the way it's done one does not get the Canon green autofocus confirming rectangle confirming focus. So it is used in Manual focus. Kolor, the makers of Autopano Pro advises to use AF and not MF. That is great except for sky, so setting the camera to f5.6 or f8 and then manualy focusing on the most important structure is a reasonable compromise here with the Gigapan Epic and the Canon G10. We should lock the light exposure. Again APP says it will blend no matter what and recommends using auto exposure so that the recesses of dark places are revealed and also bright areas are not blown. I'll follow Gigapan''s advice and lock the exposure. Identify the horizon and then place that in the top and then the bottom of the screen by using the up down arrows (see diagram above) and then each time pressing "OK" This then gives on the little screen the angle subtended by the lens. After a check list of :"Is the lens extended? ", "Is balance correct? ", etc, etc the robot moves to all the positions and takes the pictures. At any point, one can press the "X" button for the robot to pause. That will allow a truck or group of tourists to go past. My ideas is that one can use this to allow one's models to go to the next assigned spot in the set! One can, if one wishes then resume or even back up to repeat any number of the already taken shots. So this feature is very useful. So, here's a picture taken when the rain paused. 16 shots, stitched in Autopano Pro. Screen capture of the preview for the render engine. This is just to give an idea of the fit, orderliness and general lack of distortion. (I'll use the Gigapan software too shortly). In this first try, I set the ISO to 200 and I'm sorry I didn't use ISO 85 as these digicams are noisy! Still the exposure was 2 secs. That's enough but clearly too much for some of the bright windows. So some generous bracketing is really needed. Also a longer lens would enable more pixels to be devoted to smaller sections of the field of interest. Still, this little robot works, is not waterproof (I covered it with a towel) and it does what it claims to do. One niggle on the battery was that it reported it was low after only about 3 16-picture panos! It did one more but then stopped 3/4 way through the next one. Actually the voltage was 8.2 volts so this shouldn't have occurred at that voltage and also after so little use. Aside: One small issue I'm trying to unravel is getting the dwell time right. Each time allowed has to be much longer than one would think. Giving 4 seconds is not enough for a 2 second shutter exposure with the G10. There were movement streaks in the pictures at first, so obviously the robot is moving sometimes, while the shutter was still open! The streaks are too long to be due to vibration from passing traffic, which was almost zero! Lengthening the pause for each shot to be 8 seconds got rid of the streaking. Perhaps the shutter finger is slipping on the shutter and causing movement but the streaks are linear and indicate the shutter is open when the camera swing or rotates. There are a number of folk who have adapted the Gigapan units to trigger shutter release cables for DSLRs. Certainly its been done with a Nikon DX200! We'll have to find out more. x,y and z adjustment for the camera lens not just side to side and for and after although this has no limitation so far with the camera used. However, for a Epic 100 version, for larger digicams, this could be important, I do not know yet. Need to have electronic control, like Pappy Wizard, so one can bracket shots and control timing with mirror lockup and pause. Of course we could do that now just be using the current cable to the button pusher actuator and instead using that to trigger the shutter which would be set for time delay so any vibrations would settle down before releasing the shutter. For a Digicam DSLR, one could add to that bracketing exposure. Here's a good link to gigapan Pano with the 10,000th gigapano posted to that site here! Please jump in with any insights, solutions you have found or questions! Thanks for posting all the info on this very interesting device, which of course really got a lot of publicity after that 220-shot G10 shot by Bergman of the U.S. inauguration. A very mundane question since it doesn't seem to be shown on their web site on in the PDF manual: where did the device ship from? The company sounds like a strange amalgam of some college educators/researchers, Google, and others. The Gigapan is able to do well in the daytime with relatively stationary crowds. In the inauguration, the people were packed tightly and the photographer's on their platforms weren't going to move! The light was not extreme. So given a few minutes for each full pano, it would be easy to keep going until at least one pano was magical. One just would need a decent supply of batteries and SD cards. Furthermore, any frame of one set can be swapped with that of another set if the tripod is not moved. What Bergman did was wonderful. That demonstrates the major advances of photograpy with simple devices available in the hands of those with imagination. The guys in Carnegie Mellon University did at least some of the stitching from the Mars rovers! So they thought, why not use this technology to make the planet known to us? So they have built this little robot, the Gigapan Epic and its bigger versions to come, to allow anyone with a small camera to make magnificent detail rich images of every point of interest around the globe. Any set of pictures reach a particular size can be uploaded to the Gigapan pano site. The images are connected to Google maps so this has become an unbelievable rich project. They formed a company to handle this and the devices are shipped from Portland Oregon. I'm glad to report that Gigapan is very responsive and sent a new battery holder! It works perfectly with no need to fight the spring. Actually, this makes an idea spare for the unit. now I need long lasting batteries. 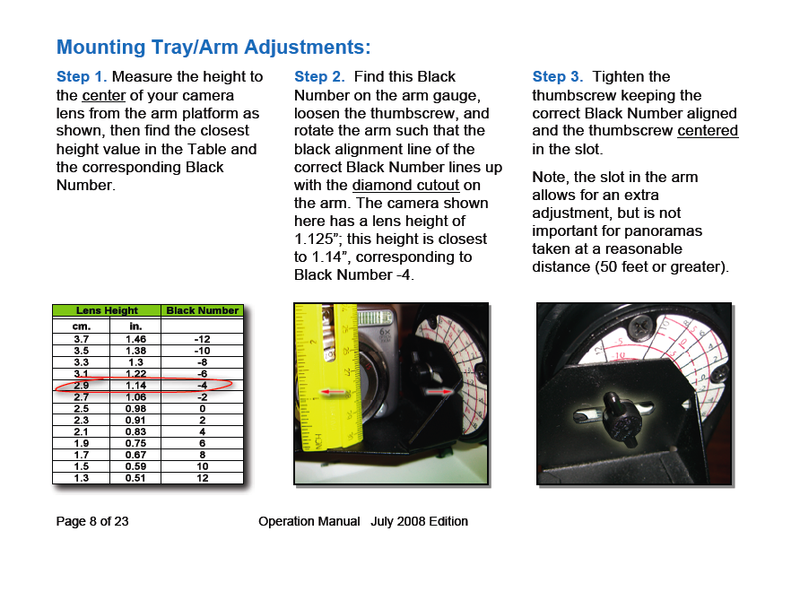 I've updated posts #4 and #5 to include references to the latest Gigapan instructional PDF. Reread to understand height adjustment. Look at recent news. This amazing device is now available on sale for just $289. I'd recommend it to you. Just have spare batteries. Bump! This is a good way to start and one only needs a digicam!